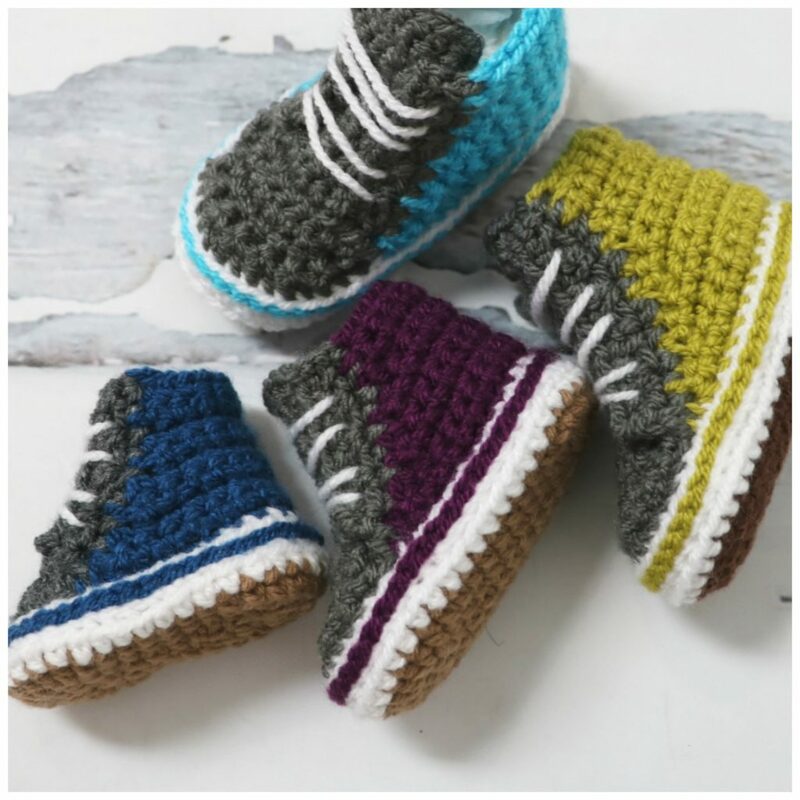 The Baby High Tops set includes a FREE chevron stitch baby blanket pattern! I had to make a little set that would be more suited to boys! 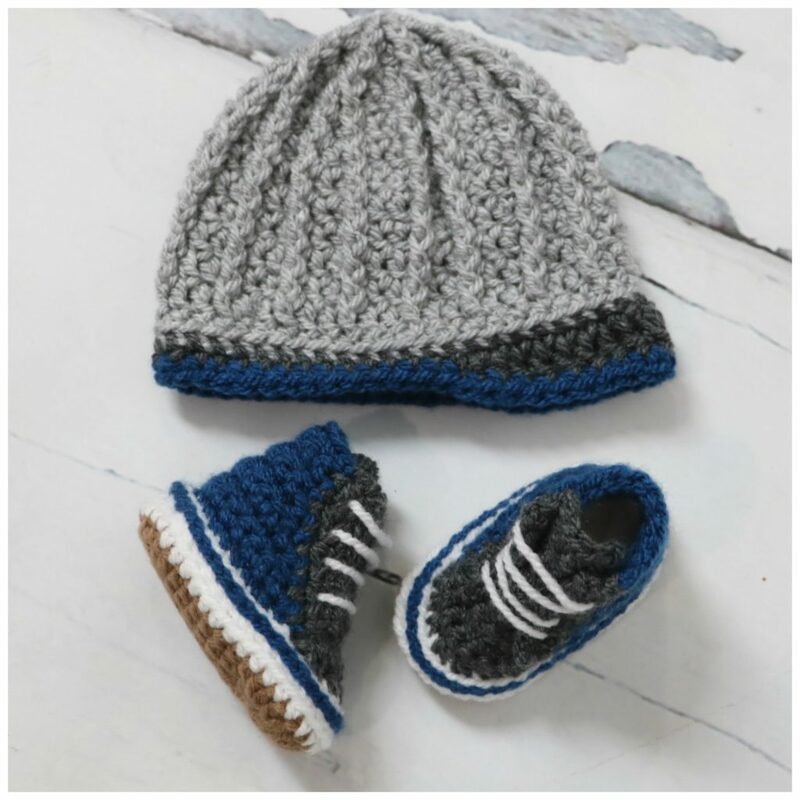 My cousin is expecting and I needed an adorable set to gift her. I was trying to decide on the style of bootie and settled on a van style high top. My kids are in love with vans so I’m assuming my cousin will love them for her baby boy due this October. My 15 year old freaked out when she saw them so I think thats a good sign! 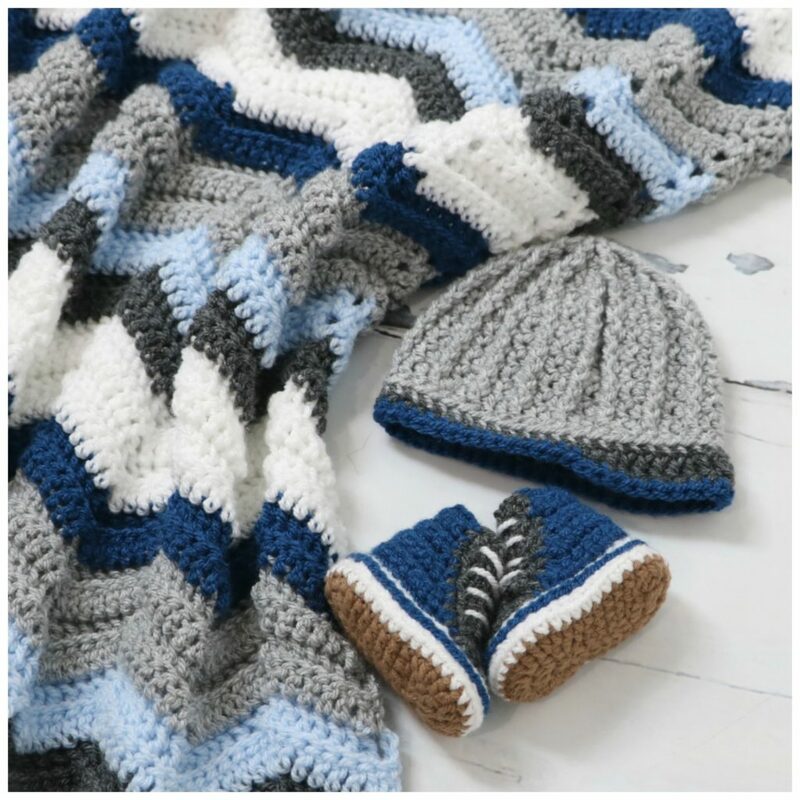 Our Chevron Stitch Blanket is worked in Double Crochet Stitches in the back loop only. My cousin has a blue and grey themed room so I hope she loves the colours I picked for her. 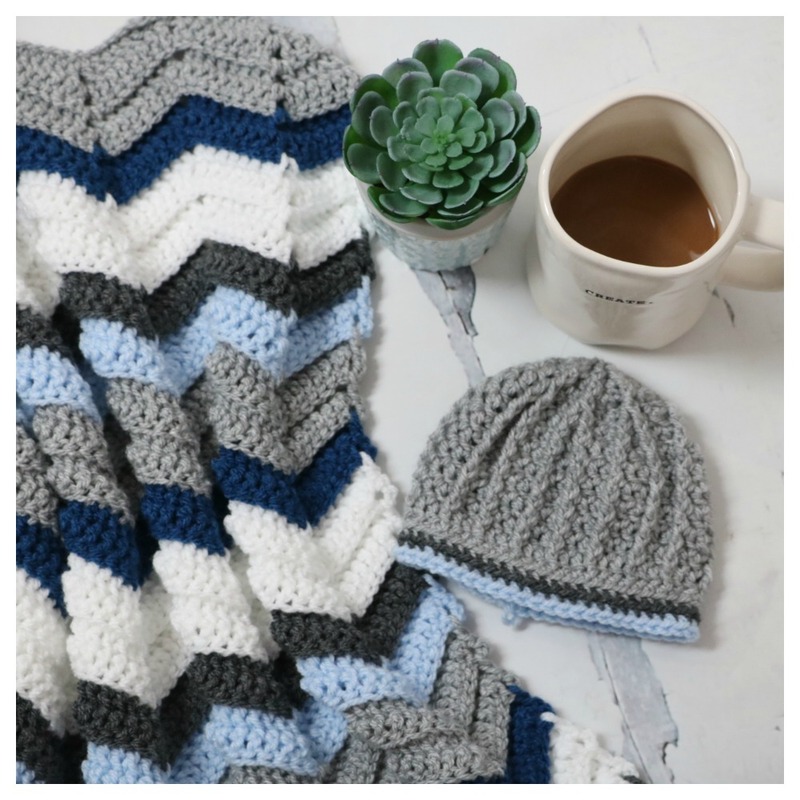 The little hat is worked in a ribbed stitch that can be made as a beanie or with a little brim. 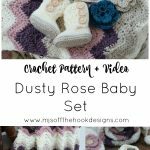 I already made The Dusty Rose Baby Set for my sister-in-law but I couldn’t resist a little pink high top set for my niece. Is it just me or is anyone else obsessed with making baby things?? 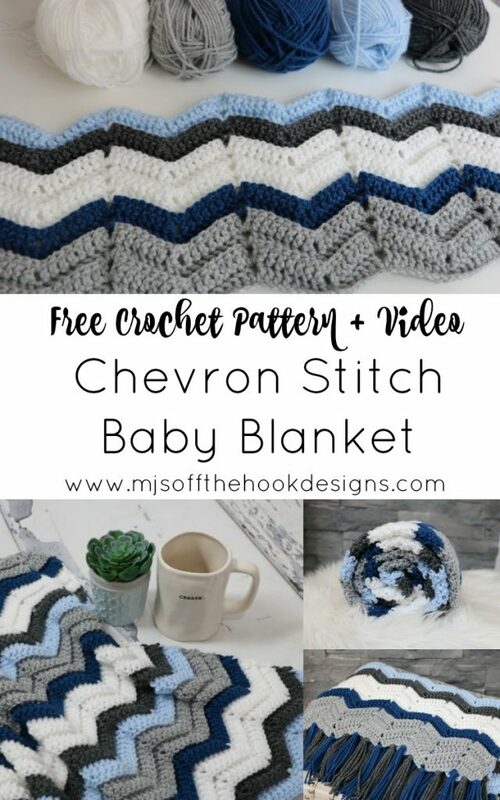 Well lets move on with the FREE crochet pattern to make this cozy chevron baby blanket. 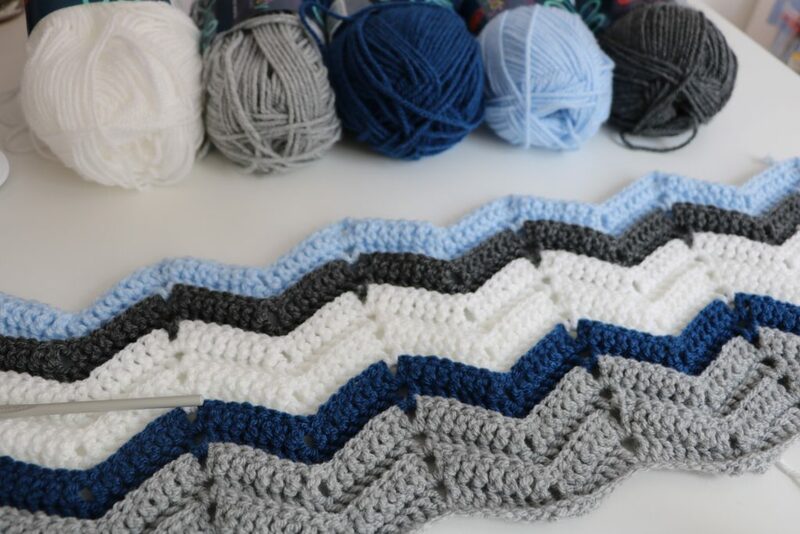 Stitch Pattern is worked in multiples of 17. When changing colors, work last yarn over of last stitch with next color. 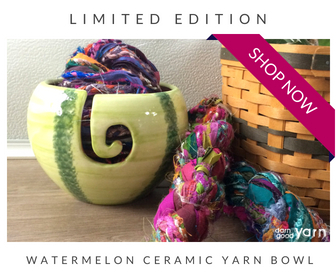 Cut yarn when changing color and crochet over ends as you go. Work all sts through the back loop only throughout entire blanket. Ch-2 sp is not included in stitch count. Setup Row (RS): Starting with MC and 5.5mm hook. Ch 136, Work 1 dc in 4th ch from hook, work 1 dc in each of the next 5 chs, work (1 dc, ch 2, 1 dc) in next ch, work 1 dc in each of the next 7 chs, *sk next 2 chs, work 1 dc in each of the next 7 chs, work (1 dc, ch 2, 1 dc) in next ch, work 1 dc in each of the next 7 chs, rep from * across, turn—128 sts. Row 1: Working in back loops only, ch 3 (counts as first dc here and throughout), sk first st, work dc2tog over next 2 sts, work 1 dc in each of next 5 sts, work (1 dc, ch 2, 1 dc) in next ch-2 sp, * work 1 dc in each of the next 7 sts, sk next 2 sts, work 1 dc in each of the next 7 sts, work (1 dc, ch 2, 1 dc) in next ch-2 sp; rep from * across until 8 sts remain, work 1 dc in each of next 5 sts, work 1 dc2tog over next 2 sts, work 1 dc in turning ch, turn—128 sts. 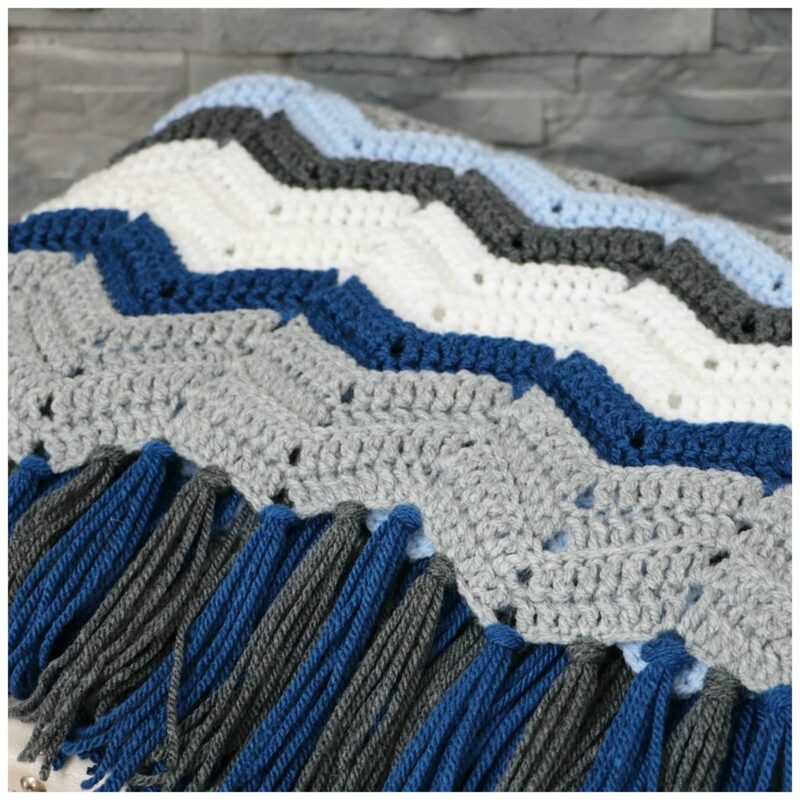 Color pattern is worked as follows; MC [4 rows], A [2 rows], B [4 rows], C [2 rows], D [2 Rows]. Repeat color pattern a total of 5 times. End with one final row of color D to finish on RS. Fasten off and weave in ends. 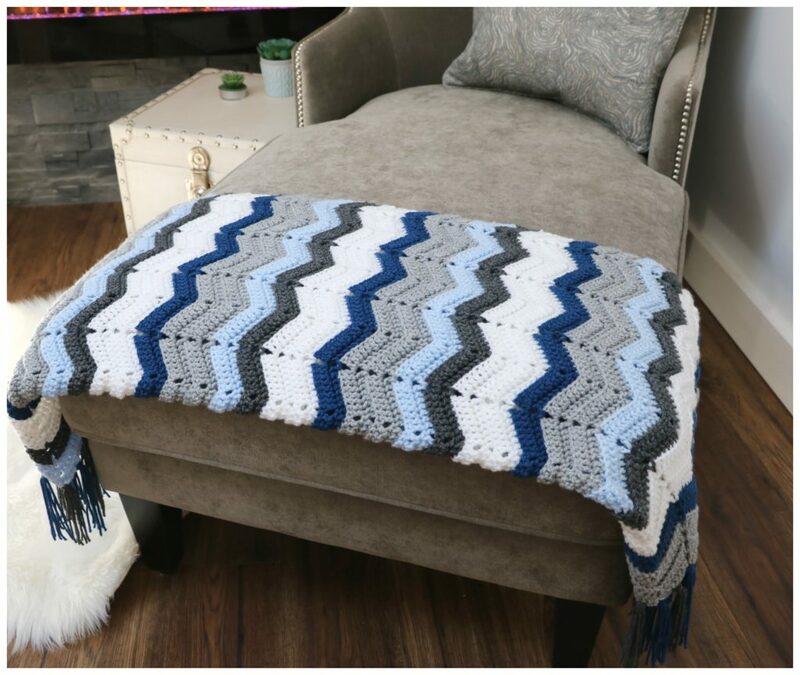 Fringe is attached to both ends of blanket. Start with color A on one end and color C on the other end. Cut 132 strands Color A and C, 12″ in length. Fringe is made up of 4 strands. 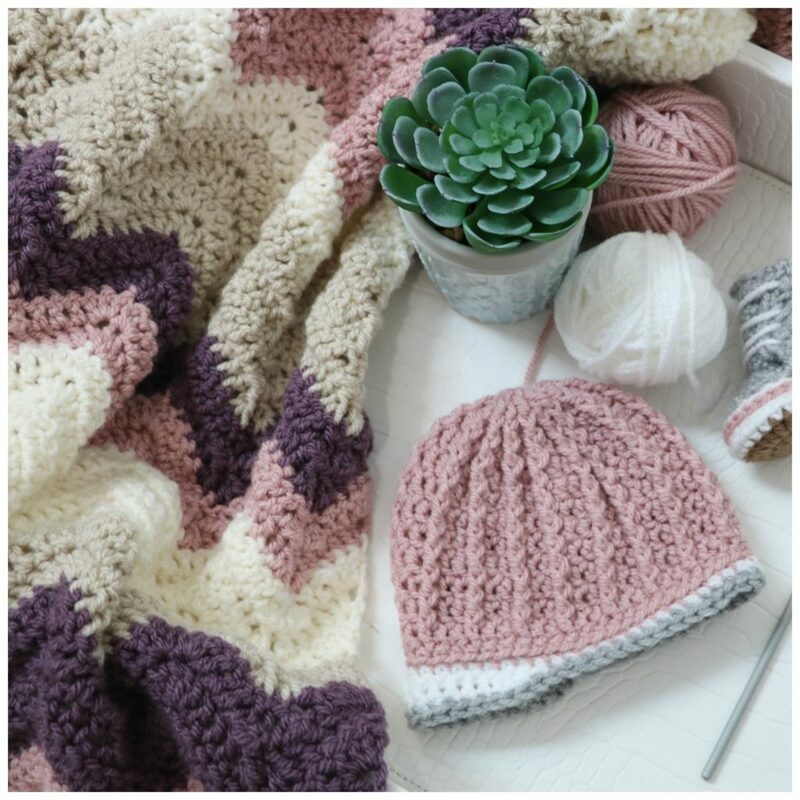 Attach fringe by inserting crochet hook through blanket, fold fringe in half and pull folded end through. Insert fringe ends through loop and pull to tighten. Steam and trim ends. 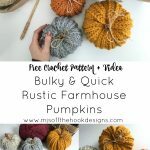 See video tutorial on YouTube. 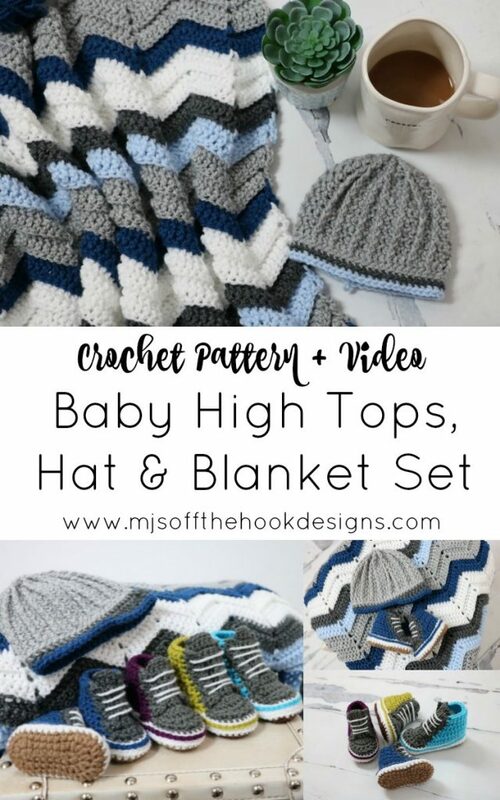 The Hat and High Tops set is not a free pattern but it does include a full video tutorial for making the hat and high tops. 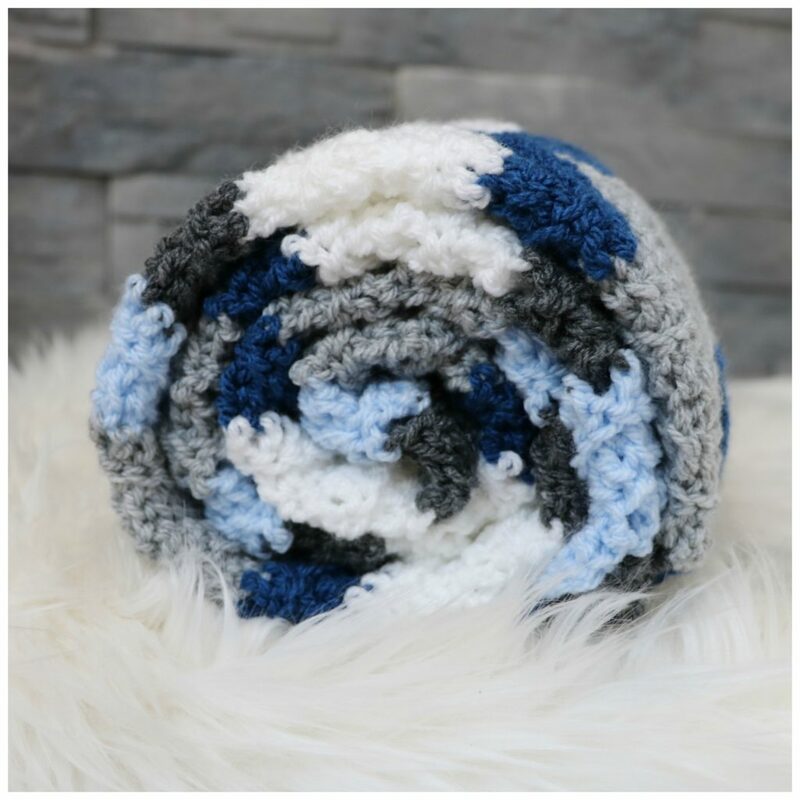 The blanket is also included in the PDF download. 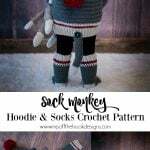 Thanks so much to everyone that purchases one of my patterns. 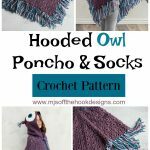 You can purchase the pattern here on Ravelry.